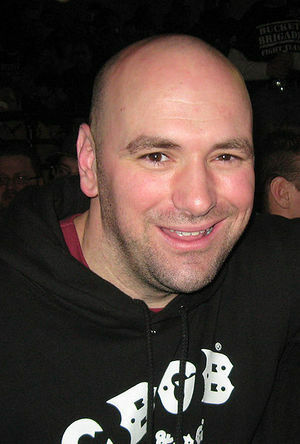 Dana White is the current president of the UFC and the public face in in promotions and shows such as The Ultimate Fighter. A bald man who was once an accomplished boxer, the charismatic White is known for his business savvy, although not necessarily for his personal ethics. He has had multiple public feuds with athletes under contract to the UFC (such as Randy Couture and Tito Ortiz) and uses a great deal of coarse language. However, during most televised UFC events involving the return of a fighter to the promotion (such as Wanderlei Silva at UFC 79), in reference to his feelings on the subject, announcers Mike Goldberg and Joe Rogan will use the phrase "as a fan" to refer to his feelings toward the sport. This page was last modified on 27 June 2016, at 19:32.